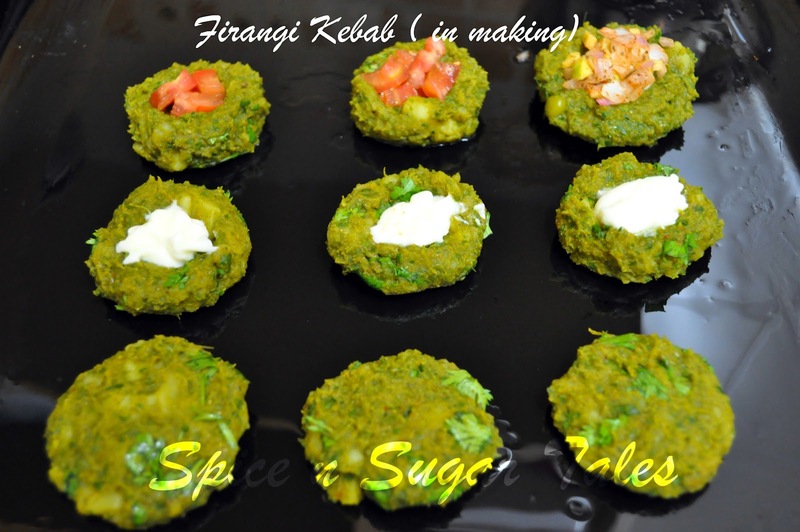 I had been thinking all night about the name I would give to this innovation of mine, and at least 10 names flickered in my thoughts, dancing here and there, and finally in the morning they all got slashed by this simple one: Firangi Kebab! To my knowledge, before I got married, 'Kebabs' only meant 'Meat Kebabs' and when my hubby told me that he has a penchant for them, I almost had a set back (of course that proves I'm vegetarian!). Now it took a couple of days for me to gather courage and then line a firing round of questions for him on when did he taste them, where, with whom, and all W's, you see. And this darling fellow, unaware of my ignorance, kept mum and smiling all the while. At last, when he unveiled the truth, I was almost in a shock, not because he was having some meat kebabs, but because Kebabs could be vegetarian, too. He belongs to the 'City of Nawabs: Lucknow' and for them Kebabs are as common as Aloo Ki Subji for us ( haha, I couldn't find a better one to compare with! :P). After my first visit to this splendid city, I surely could sense and breathe his love for them. The street-side small shops selling 'Dal Kebabs' caught my eyes the first, and then nothing could treat my craving well than those melt-in-the-mouth, utter-soft kebabs with audacious flavors of bay leaves and cloves...woooh!! Since then, I've been a killer-lover of them and with every visit of mine to that place, Kebabs are sure to rock the Dining Table at least once a week. 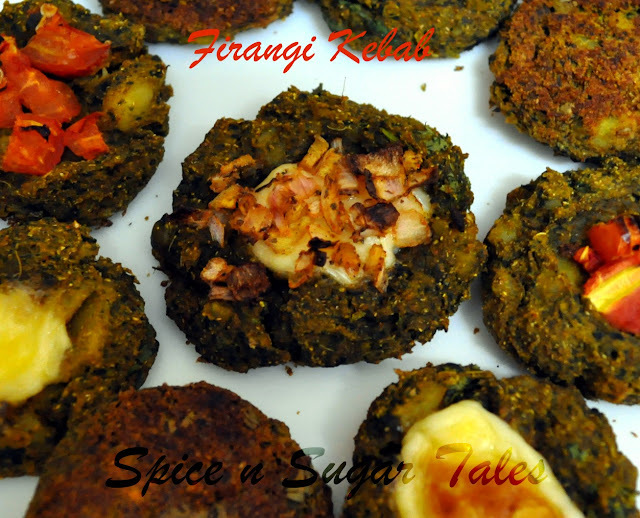 Now here in Kenya, I do not have ' Masoor Dal' to rock my time, so I came up with a 'Firangi' version of the very famous and notable 'Hara Bhara Kebab'. The name 'Firangi Kebab' definitely has a significance behind because I have baked them in a 'Firangi Fashion' with Mayonnaise and Tomato Salsa, rather than keeping them Tawa/ Shallow Fried. The topping here varied as I was highly keen to introduce just any chopped thing I could in them. Kebabs in India are more or less similar to most other kebab preparations along with their distinct taste which can be credited to the spices native to the sub-continent. All the varieties such as Sheekh, Doner (known as Shawarma), Shammi Tikka, and other forms of roasted and grilled meats are savoured in this part of the world along with the vegetarian forms which are no less in flavors. Pressure cook the peeled potatoes and green peas with not much water. Pre-heat the oven on Max/ 300degrees Celsius for 10 minutes. Line the baking sheet with parchment paper/ grease it well. Take the boiled vegetables and mash them in a bowl. Add the remaining ingredients and make a soft dough. I did not use corn flour, but can do so for better binding. The dough will be sticky, so grease your hands with oil and then divide into 8-10 equal portions. Make balls and flatten them between your palms. Make a small dent in the centre for the topping to stand on. Smear a little oil/ghee on all sides. Transfer them to the baking tray. Now top them with Mayonnaise/ Grated cheese and the chopped vegetables. Addition of Chat Masala is optional. Bake/ broil for 20-25 minutes on Max/ 300 degrees Celsius or till you find the bottom brown and crisp. Carefully take them out making sure the bottoms don't break on removing from the sheet. If the bottoms stick to the sheet, use a thin wooden khurpi/laddle to detach them. Serve hot with Pudina Chutney/Mint Dip. If you do not have an oven or you like them to be softer, shallow fry them on a tawa/ skillet. The topping is all about the innovation going on in your mind. You could have an Italian Topping by pushing in some diced jalapenos, olives, corn and capsicum or you could go desi by throwing some chopped raw mango and onion with chat masala in it. In place of mayonnaise, you can also use grated cheese or mozarella cheese, or even a cheese spread. If you want them crispier, bake for a longer period and vice versa. If the dough is too soft to handle, add in more corn flour. But remember, the moisture will all vanish on baking/broiling and too much corn flour will harden them at last. If you are interested in plain kebabs, just keep them simple without any topping and sprinkle some lemon drops and chat masala on them. Quiet new to me !! looks wonderful !! Thanks for linking to the event !! 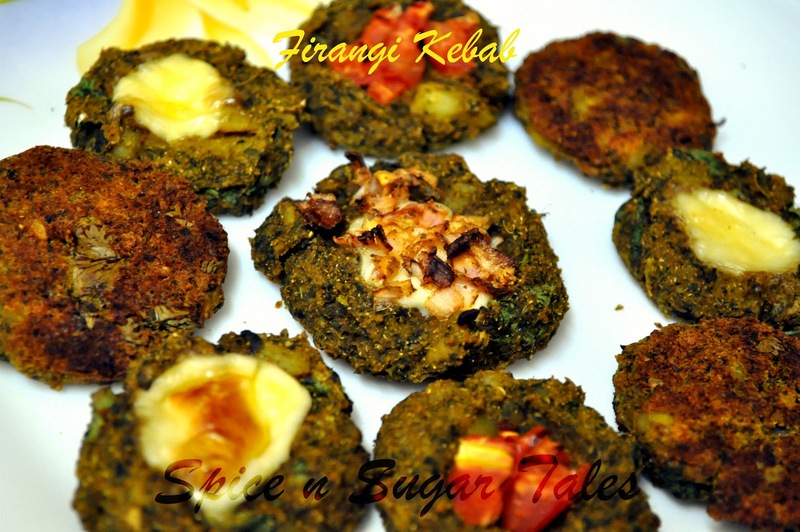 quite innovative and healthy kebabs. Love the way you have prepared. Of course the name suits the recipe. Really loved the idea of baking the kebabs and the toppings are wonderful ! Nice presentation & Lovely kebabs. wow...lovely yummy kebabs....great creativity !! 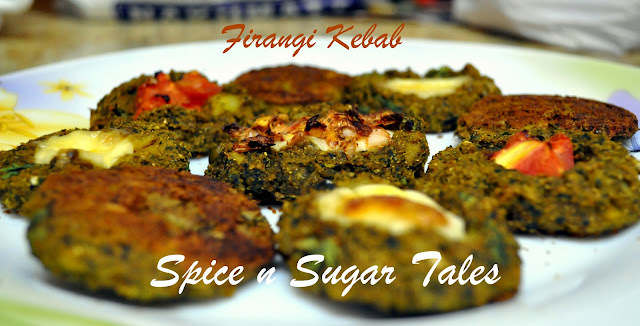 !i just love d name firangi kebab!! !great work gal !!! loved your recipe name, kebab sounds innovative and yummy...nice recipe dear!! these kababs looks awesome. Love them... can I have a bite please? These kebabs look lovely! Love the combination and firangi touch. Anjali these look lovely:)..book marked!! Those look so good..thanks for the entry! On going event: Gimme GREEN!